Say it with words. 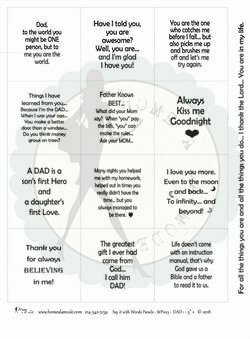 DAD is a Home a la mode word panel that is all about sending a message in a quilt or project using the words that you just don't seem say out loud enough to your DAD. He raised you and giving him something to remind him of you is so important... words like: Dad, to the world you might be ONE person, but to me you are the world. - Have I told you, you are awesome? Well, you are... and I'm glad I have you! - You are the one who catches me before I fall... but also picks me up and brushes me off and lets me try again. - Things I have learned from you... Because I'm the DAD... When I was your age... You make a better door than a window... Do you think money grows on trees? - Father Knows BEST...What did your Mom say? When "you" pay the bills, "you" can make the rules... Ask your MOM... - Always Kiss me Goodnight - A DAD is a son's first Hero and a daughter's first Love. - Many nights you helped me with my homework, helped out in times you really didn't have the time... but you always managed to be there. - I love you more. Even to the moon and back... To infinity... and beyond! - Thank you for always BELIEVING in me! - The greatest gift I ever had came from God... I call him DAD! - Life doesn't come with an instruction manual, that's why God gave us a Bible and a father to read it to us. - For all the things you are and all the things you do... I thank the Lord... You are in my life.